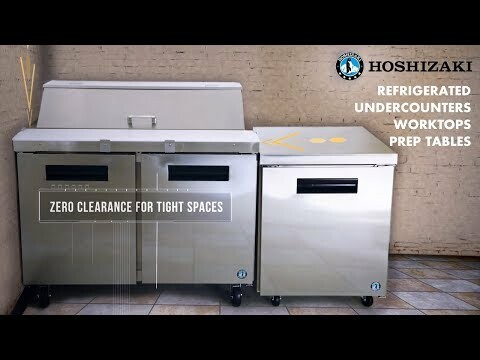 Home / Restaurant Equipment / Commercial Refrigeration / Prep Table Refrigeration / Sandwich and Salad Prep Tables / Hoshizaki CRMR48-12 Commercial Series Sandwich Top Refrigerator, 48"
Hoshizaki CRMR48-12 Commercial Series Sandwich Top Refrigerator, 48"
The Hoshizaki CRMR48-12 Commercial Series Sandwich Top Refrigerator, with stainless doors, is an attractive addition in any kitchen. With a capacity of 13.66 cubic feet, this front breathing unit is perfect for tight spaces. It is constructed of stainless steel, which protects this unit from accidental damage and rust. Plus, it is easy to clean. The CRMR48-12 includes (2) epoxy coated shelves and (12) polycarbonate plastic 1/6 size pans (4 inches deep). This sandwich top refrigerator comes standard with (4) 6 inch stem casters (2 with brakes) and a 48 by 10 inch white polyethylene cutting board. It also features a spring assisted self closing door, with stay open feature.